I think you’ve heard me say this a few times but I’m not the most organized person. You see I love the idea of organization. I like things to be in order. I like items to be easy to find. 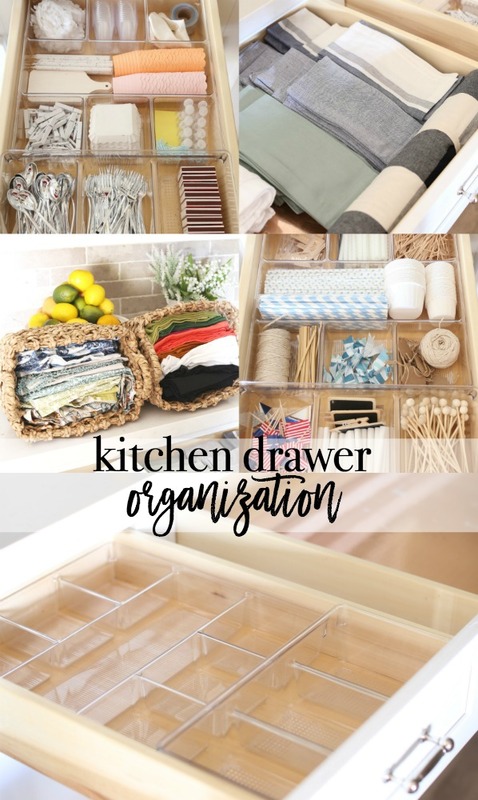 I love the idea of ” everything having a place” But when it comes to everyday life, organization seems to take a back seat. Some how my ONE junk drawer turns into 10 junk drawers. haha! You too? 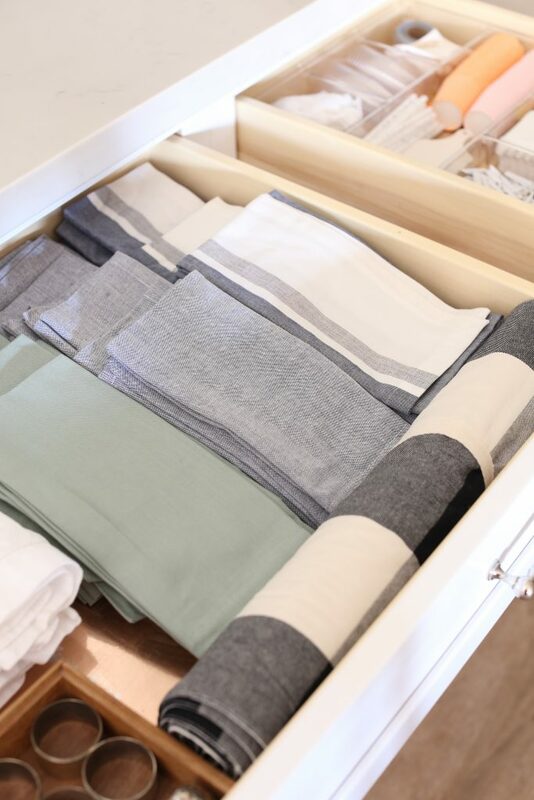 But kitchen drawer organization is one of those projects I always put off ,so when I found myself turning the entire house upside down looking for my chambray napkin set for a shoot I was doing, I knew it was time to get things in order! I absolutely value organization systems. Especially in the kitchen. 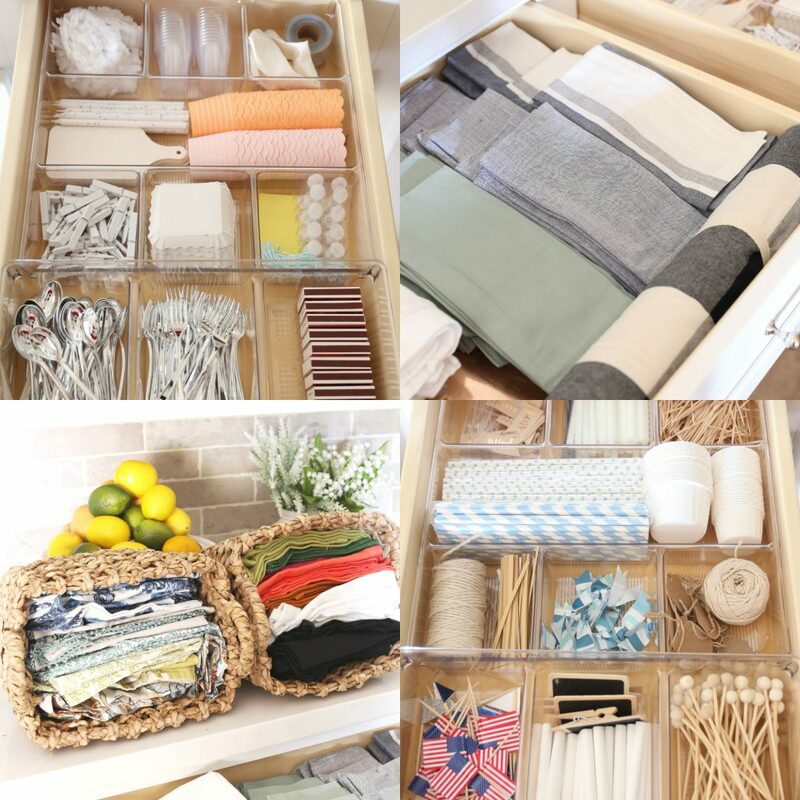 It’s crazy what a few drawer organizers will do for your drawers. 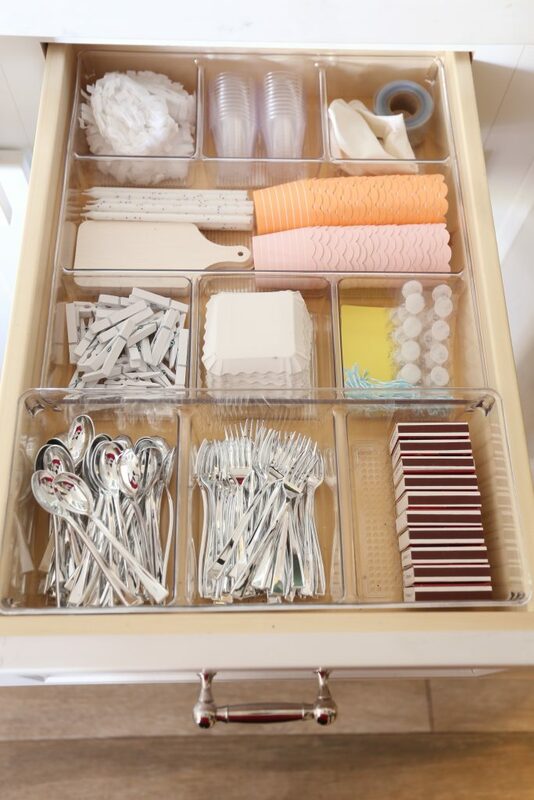 SO before I even decided what to do and how to organize, I measured each drawer so I could maximize all the space. Pictured above are three drawers. Two of them are the same size and then one large one in the middle. 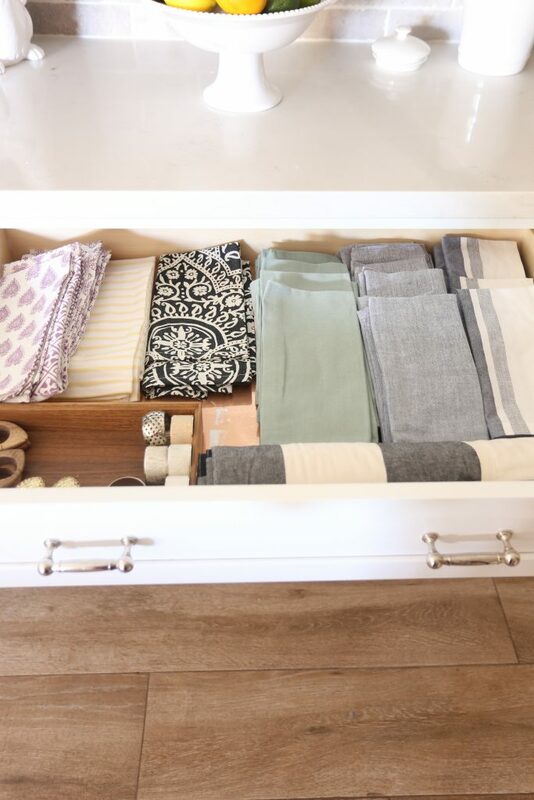 I know for sure I wanted to keep seasonal napkins in the middle drawer so I didn’t measure it for any organizers. 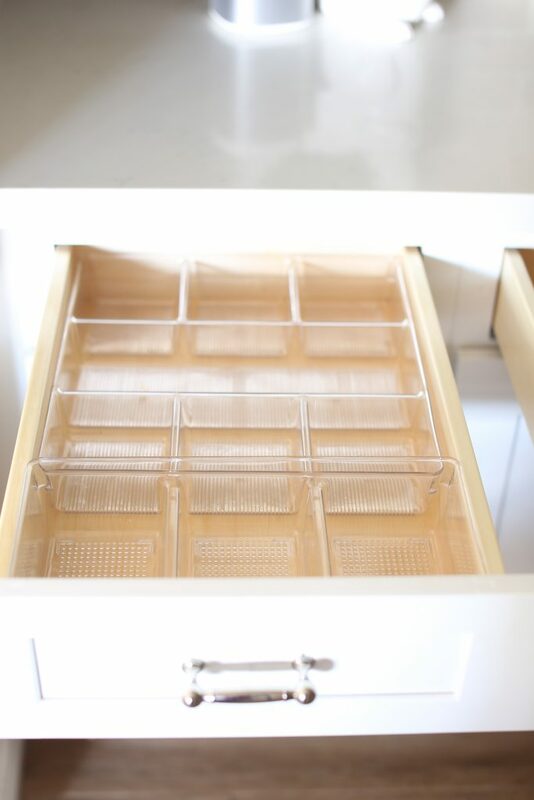 The two side drawers were a perfect fit for two clear organizers from my favorite, InterDesign. 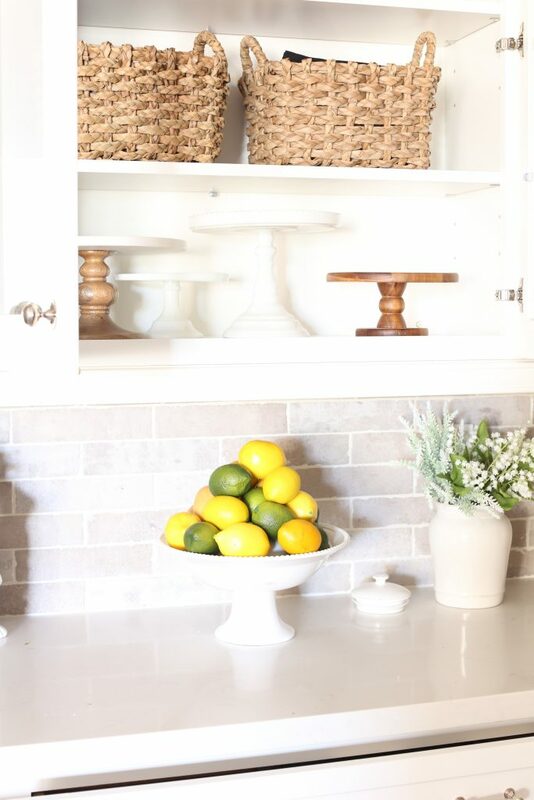 I’ve worked with them before on my pantry and like I said they are most likely in your home too! I picked these up from HomeGoods a while ago but you can find them here and here! This area is right off the kitchen and my original thought was to keep all of our entertaining items over here. That includes my collection of cake plates, serving-ware and extra specialty dishes for styling and entertaining. The drawers before ( I ALWAYS forget to take a photo) were used for random items and one off screws and tidbits from different projects. So it was nice to see the space clear so I could see how I wanted to use it! Here’s what I added to the area. All the items in this drawer are items I find I use when we entertaining. A lot of these are actually party and catering supplies! I’ll describe them starting from the right bottom corner. I love to use these for sandwiches! I order big platters for our parties and these keep them all together and look cute! You can get them here! Do you remember I used them for Livy’s party last month? Chalk is a must! I even have these little clip ons that I can attach to plates or platters or bowls when I want to label them. Picks again for food! Put them on just about anything. Obviously these have a patriotic theme so they will be great for our Memorial Day party. Twine and tags. I use these to tie up items from my garden and give them to my friends. Just makes the presentation a little sweeter! Another roll of twine and twist ties for tying up cellophane bags! Paper straws are great to have on hand for the kids and their friends. Simple and sweet! I use to have so much more but we like the plastic ones a little better. Those white cups are great for little samples of food and frozen treats. Toothpicks! Used for just about everything food related! Candles. I never EVER have candles when I need them. Hopefully this spot will always be loaded with birthday candles for all of our special celebrations. I even have some sparkle ones back there which are my favorite! They look like little fireworks! More picks. Different Color! I obviously love picks. They make your cupcakes or food look so much more festive! 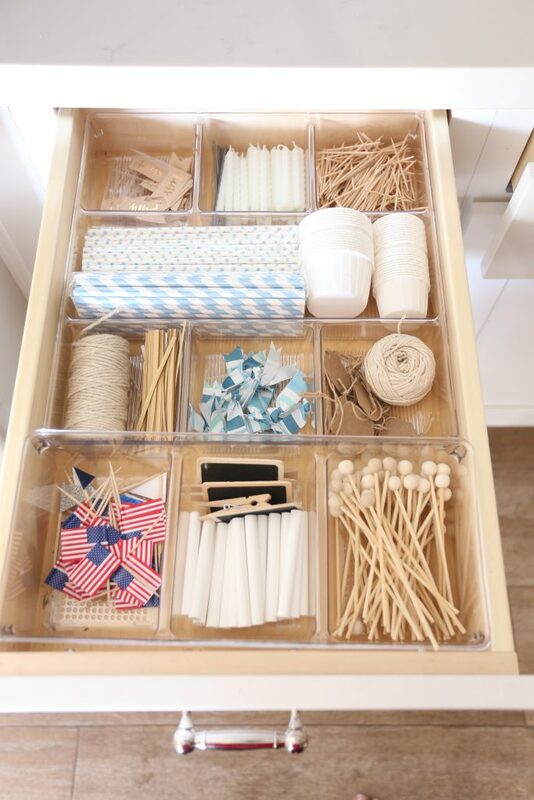 Moving onto the middle kitchen drawer all organized with napkins! 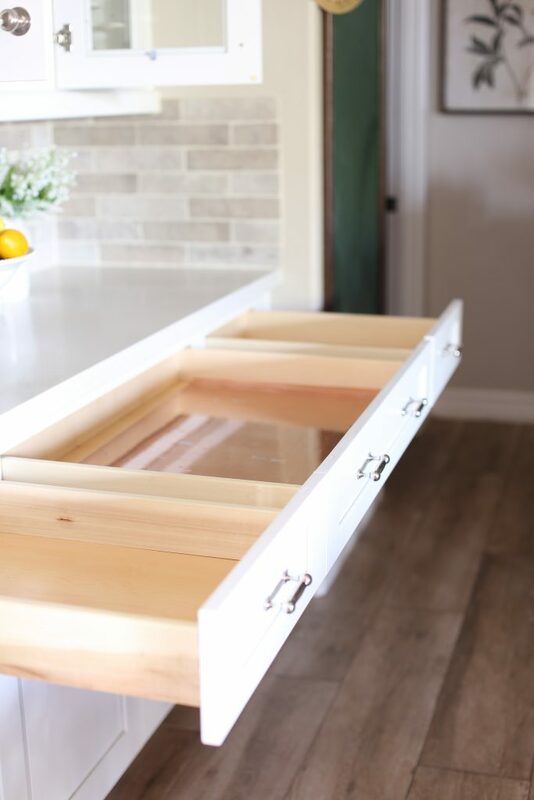 I thought this large drawer was perfect for seasonal napkins. I don’t have a large collection of disposable cocktail napkins, but if I did I would put them here too! I don’t know how many times we’ve had just a few friends over and I go to get napkins and nothing coordinates! lol Not a big deal but I would like to catch some on sale and start a little stock of them. In the mean while I keep our seasonal napkins here. We don’t use them that often but it’s a great place to store them! Plus some napkin rings and off season salt and pepper shakers and a table runner. 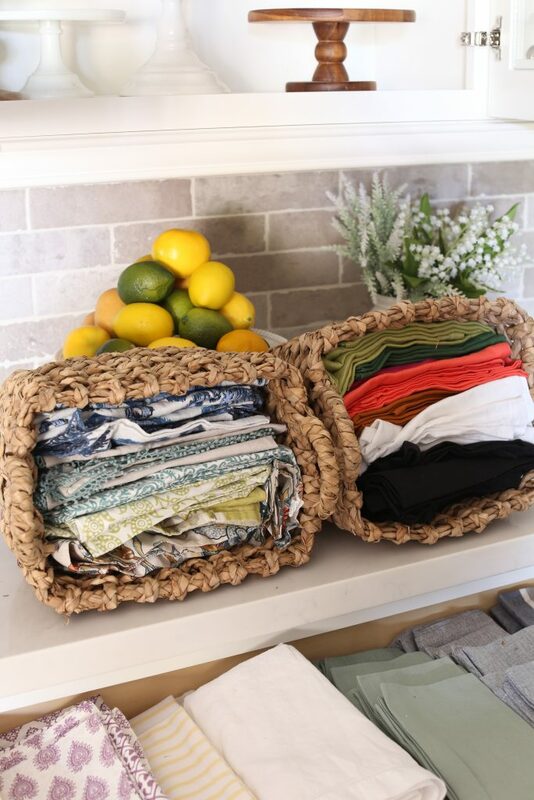 I actually have a lot more sets of napkins that I keep in these baskets and store in our cabinet. 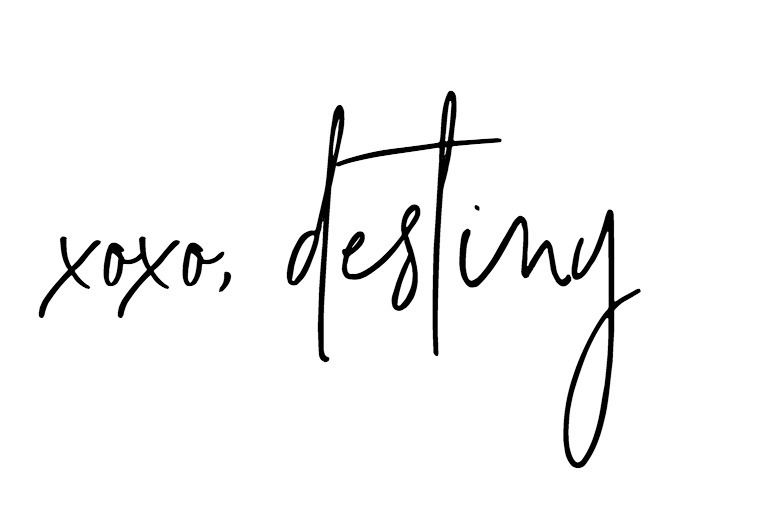 You can shop some of my favorite below! The other kitchen drawer is actually pretty similar to the other one. I used the same configuration and organized some other entertaining items. Starting from the right bottom corner! Matches. I also have a click lighter but it’s always nice to have some old school ones too. Itty bitty spoons and forks for small portion foods. Seriously perfect for kids! Velcro and tags. I like to use these again for labeling foods or labeling in general. The velcro is nice when the surface is not great for labels! Mini plates. Again, small foods! Lol I know! haha! But they are great for little portions. I find these at Homegoods all the time! 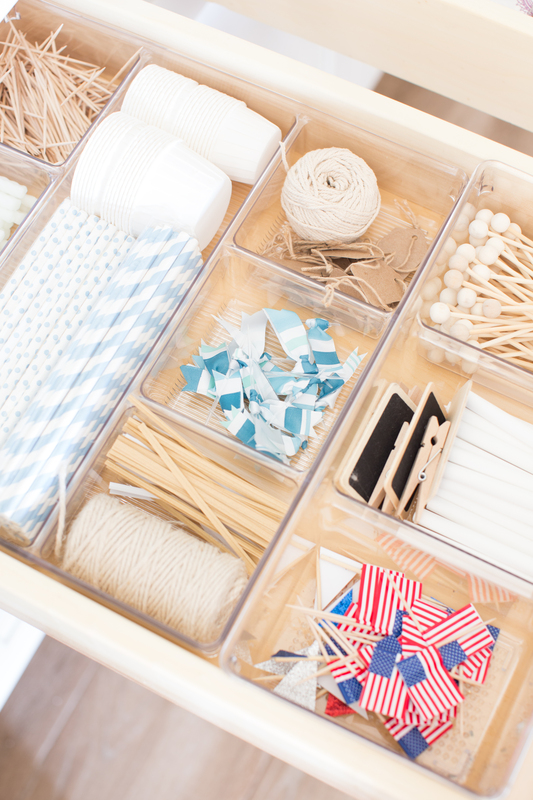 Clothpins are great to have for attaching party supplies or hanging items or again food labels. Cupcake liners I keep for baking and for scooping up goldfish, pretzels or anything else. Cheeeboards I just found. I think these will be cute to serve on at parties! Imagine little cheese samples and crackers! Balloon tape! Remember I used that for Livy’s party! I also have extra balloons just in case! More little cups. For communion. lol! Just kidding! hahaha! Last little corner is some paper decor I had left over from a party! Easy to use and store! 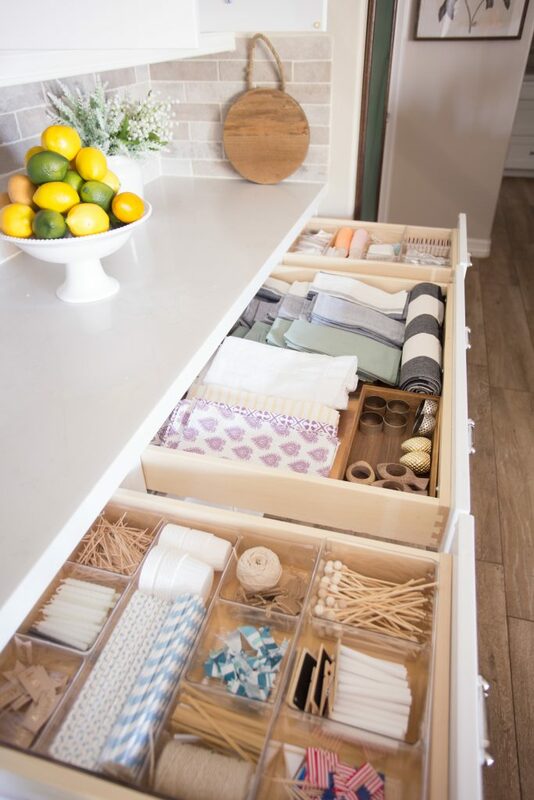 So are you ready to tackle some kitchen drawer organization in your home? What are your favorite tips and tricks?! If you have any questions about products just let me know! I’ll try to get you a link if it’s not already mentioned!